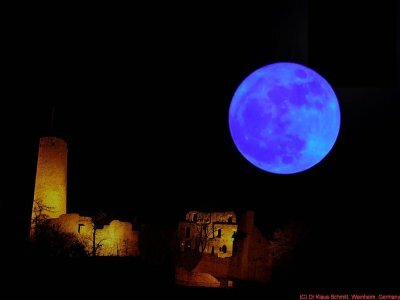 Today is a 2nd full moon within the same month, a "Blue Moon", which I have previously shot in reflected ultraviolet photography using my "work horse" UV filter, the Baader-U filter, and then superimposed to a normal night light shot of our castle here. Lens was my CERCO 94mm quartz flourite lens. 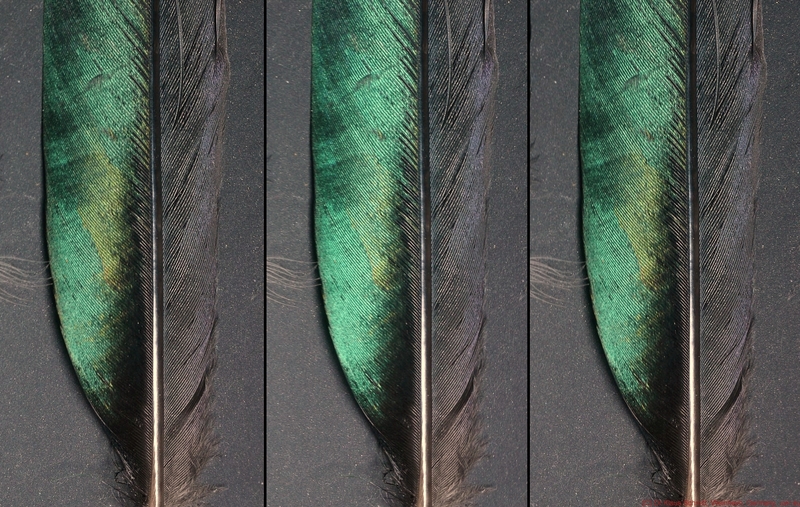 All shots were done at about f5.6. Indeed, the moon has UV reflectance and it can be recorded using proper equipment which makes that nicely visible. The ZDF has contracted me and my UV cameras to contribute to their series ZDFzeit which will now be aired on August 25, 2015 at primetime 20:15 hours CET showing the effect of dangerous UV radiation on human skin and the effect of using proper suncreme to protect against that (in German language, with subtitles). 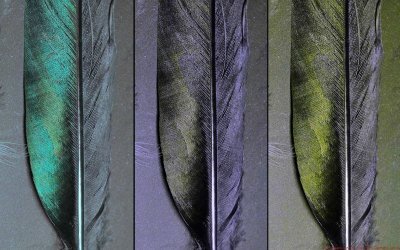 Quite impressive and graphic results have been obtained, worth watching to see what a human sees and how that same scene looks like in ultraviolet (UV) light! 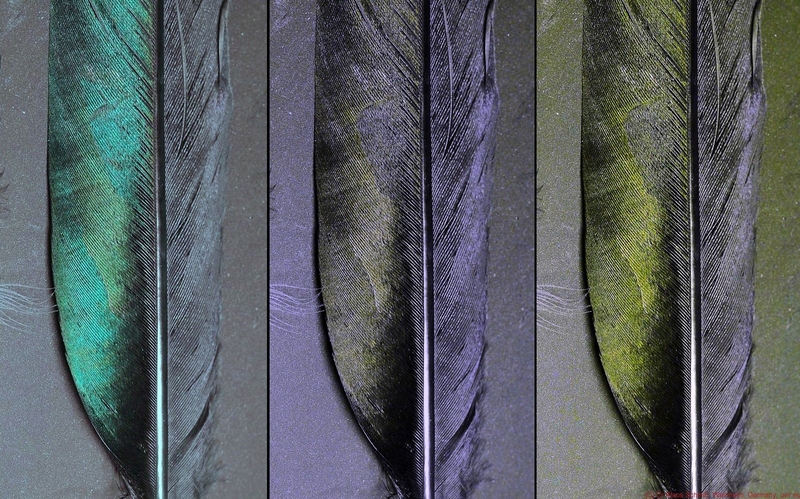 Today shots of quite pretty feathers of an European Magpie - Pica pica in reflected ultraviolet photography using my "work horse" UV filter, the Baader-U filter and a longer wave UV. Lens was my UV-Nikkor 105mm quartz flourite lens. Light source was a modified for high UV output Xenon flashlight. All shots were done at f8. 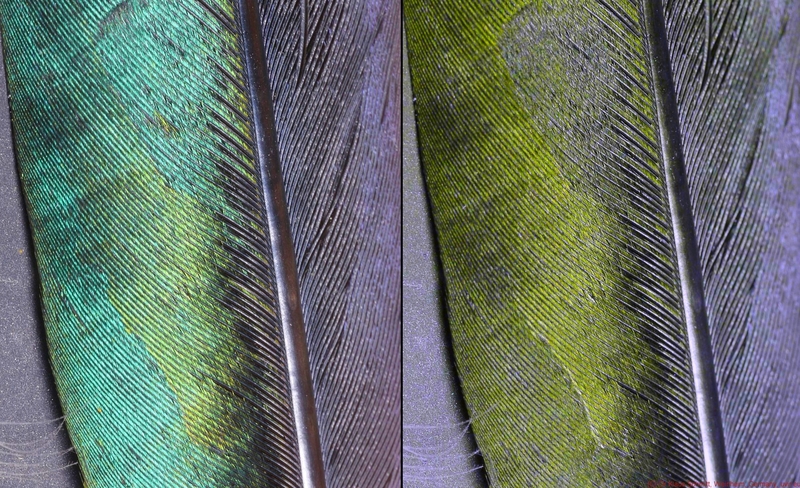 This attractive bird has iridescent feathers with a metallic green and blue shine maximized under a 45 degree reflection angle, however it also reflects UV quite well peaking at around 365nm (left) and to some lesser amount 385nm (right), invisible to us humans, and all this gets nicely visible. Today shots of the very decorative late summer berries of the Snakeshead - Arum maculatum in reflected ultraviolet photography using my "work horse" UV filter, the Baader-U filter, as well as in simulated bee vision using my proprietary XBV filter. Lens was my UV-Nikkor 105mm quartz flourite lens. Light source was sunlight. All shots were done at f8. This attractive berries shows no prominent UV pattern, but a metallic like shine, peaking at around 365nm, invisible to us humans, and all this gets nicely visible. Today more shots of a group of decorative summer flowers Missouri Coneflower - Rudbeckia missouriensis in reflected ultraviolet photography using my "work horse" UV filter, the Baader-U filter, as well as in simulated butterfly and bee vision using my proprietary XBV filter. Lens was my UV-Nikkor 105mm quartz flourite lens. 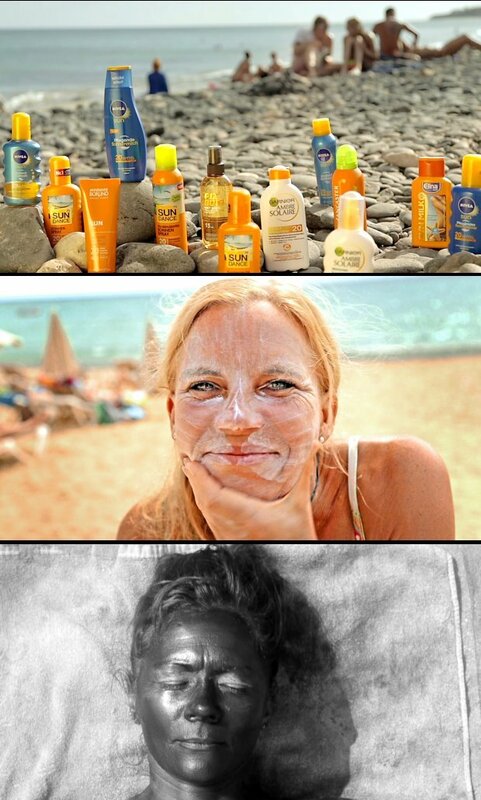 Light source was sunlight. All shots were done at f8. This attractive flower shows its very prominent UV bullseye pattern, its petals have an UV dark bottom and very UV bright tips (around 365nm), invisible to us humans, and all this gets nicely visible in this group shot. Today shots of a decorative summer flower Missouri Coneflower - Rudbeckia missouriensis in reflected ultraviolet photography using my "work horse" UV filter, the Baader-U filter, as well as in simulated butterfly and bee vision using my proprietary XBV filter. Lens was my UV-Nikkor 105mm quartz flourite lens. Light source was sunlight. All shots were done at f8. Today shots of a decorative summer flower Orange coneflower - Rudbeckia fulgida in reflected ultraviolet photography using my "work horse" UV filter, the Baader-U filter, as well as in simulated butterfly and bee vision using my proprietary XBV filter. Lens was my UV-Nikkor 105mm quartz flourite lens. Light source was sunlight. All shots were done at f8. 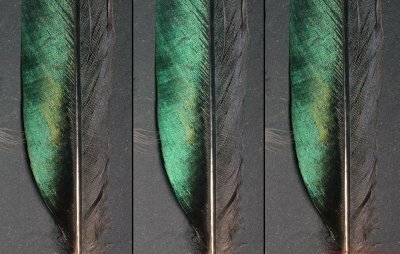 Today about something rather unique, a variable UV transmission filter (XVUV) for reflected UV photography. Well, actually one with an adjustable / variable transmission shoulder which may be steplessly adjusted by some 20nm. I tested it for the first time now using the Baader-U UV pass filter for comparison, a UV-Nikkor 105mm quartz flourite lens and my UV sensitive camera. Light was sunlight on a bright sunny day. 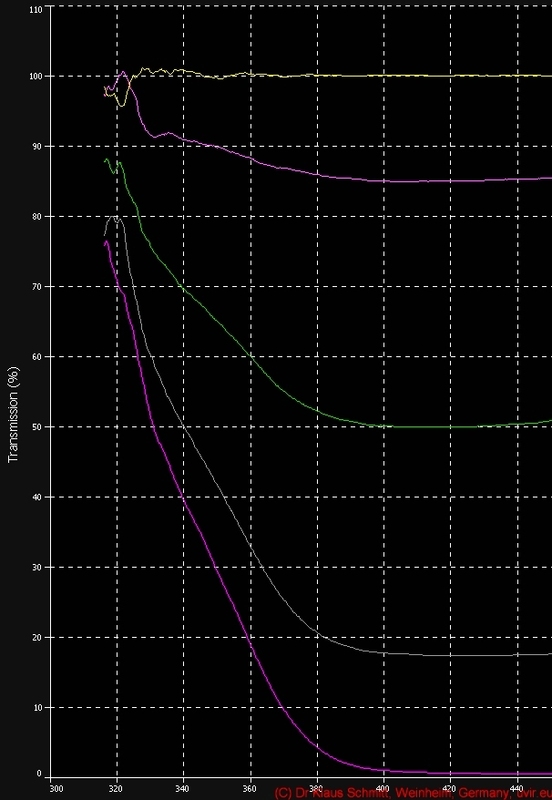 This filter now allows to steplessly shift the peak transmission from about 360nm down to some 340nm, albeit with some loss of peak transmission. 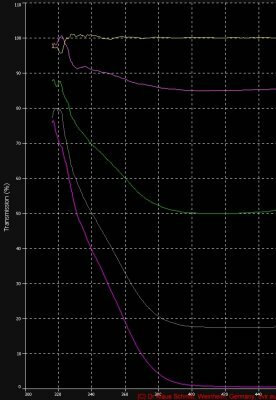 I will report more about that XVUV variable UV transmission filter here later, as more testing, calibration and optimization needs to be done. 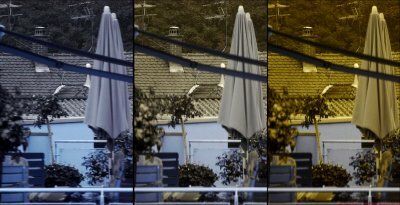 Today about another, faster filter for reflected UV photography, as there still seems to be some demand for handheld UV shooting or shooting at higher speeds for instance for video work. This here is the XNUV2, that I finally tested for the first time now using the Baader-U UV pass filter for comparison, a UV-Nikkor 105mm quartz flourite lens and my UV sensitive camera. Light was late evening light on a rather dull day. What is important to notice is, that also the XNUV2 is also able to precisely reproduce this distinct flower UV pattern, as well as it shows good sharpness, as compared to the Baader-U filter. And most importantly it is 2.3 stops faster than using the Baader-U filter, which is quite an impressive result as it will make it much easier for video work. As I was testing a Nikon UV-Nikkor f4.5 105mm, I thought it would be interesting to compare it to my CERCO f4.3 94mm workhorse lens, especially about possible chromatic aberration, sharpness and contrast. Target was a metallic precision ruler, light was sunlight. Only visible light photograhy was done here. CERCO top, Nikon bottom. Increasing f-stop setting towards the right, starting fully open leftmost. Both lenses do not show CA. 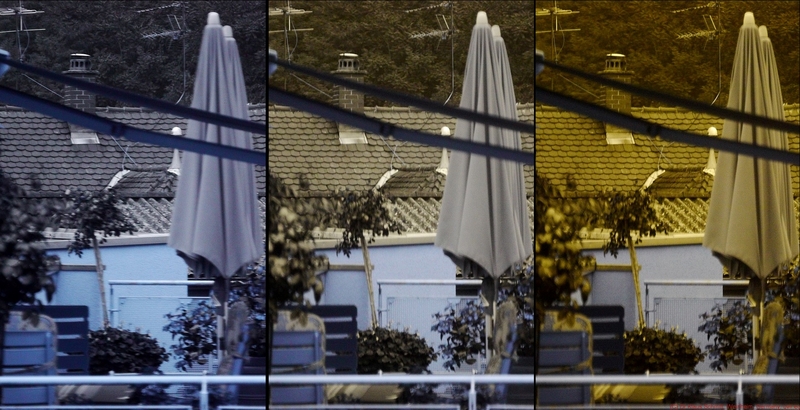 But interesting to note, how much higher the contrast of the UV Nikkor is. The CERCO shows futher decreasing contrast when stopping down (to the right) although flare control was used by using a deep hood against stray light. Both lenses are very sharp, but overall the Nikkor seems to be the clear winner here and it also covers FF sensors, which the CERCO does not do. 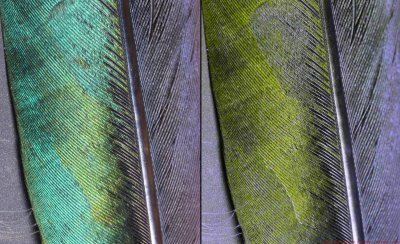 Both are excellent lenses in terms of sharpness, but contrast and flare always need special attention, especially when using the CERCO multispectral lens. Today shots of very decorative summer flowers, Mexican Zinnia - Zinnia haagenea in reflected ultraviolet photography using my "work horse" UV filter, the Baader-U filter as well as a 340nm short pass filter for deep(er) UV photography. Lens was my CERCO 94mm quartz flourite lens. Light source was sunlight. All shots were done at about f5.6. 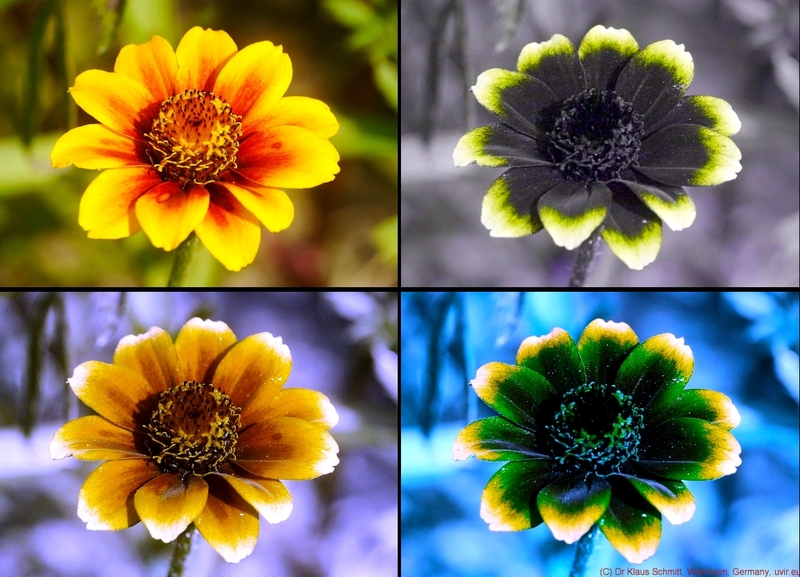 Mexican Zinnia flowers have very specific UV patterns which reach quite deep into UV. Their petals are very UV dark in the middle and bottom, their petal tips, however, are very UV bright (here around 370nm outer tip, 365nm middle tip). Deeper UV photography reveals, that the outer tip part reaches even deeper into UV, deeper as any other flower I know of, and all this gets nicely visible. 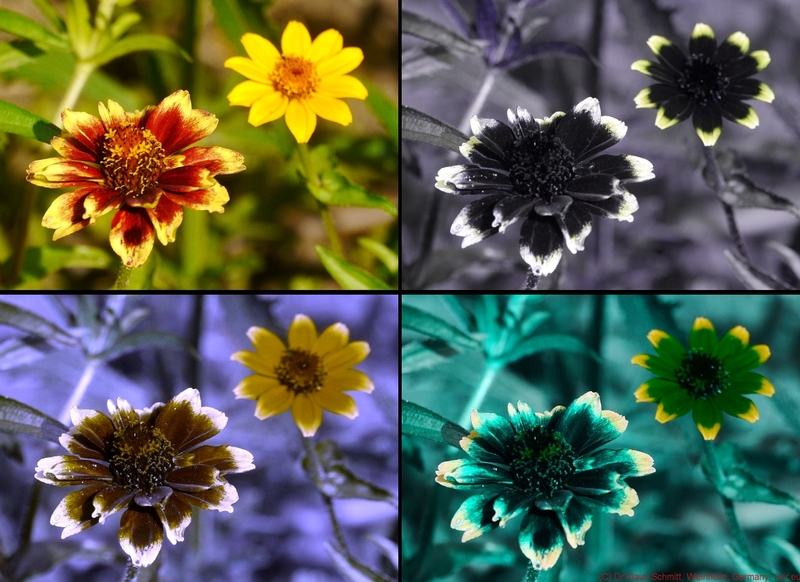 Today shots of very decorative summer flowers, Mexican Zinnia - Zinnia haagenea in reflected ultraviolet photography using my "work horse" UV filter, the Baader-U filter. Lens was my CERCO 94mm quartz flourite lens. Light source was sunlight. All shots were done at about f5.6. 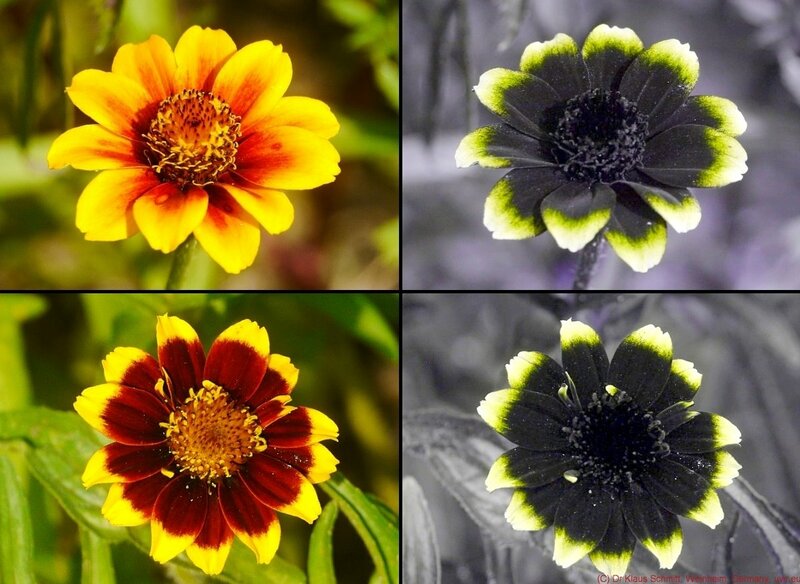 Mexican Zinnia flowers have very specific UV patterns and here, although their visible representations look very differently, their reflected UV pattern is nearly the same. Their petals are very UV dark in the middle and bottom, their petal tips, however, are very UV bright (around 370nm outer tip, 365nm middle tip, 350nm border to dark), reaching deeper into UV as any other flower I know of, and all this gets nicely visible. Today more shots of a very decorative summer flower, Mexican Zinnia - Zinnia haagenea in reflected ultraviolet photography using my "work horse" UV filter, the Baader-U filter as well as in simulated butterfly and bee vision using my proprietary XBV filters. Lens was my CERCO 94mm quartz flourite lens. Light source was sunlight. All shots were done at about f5.6. 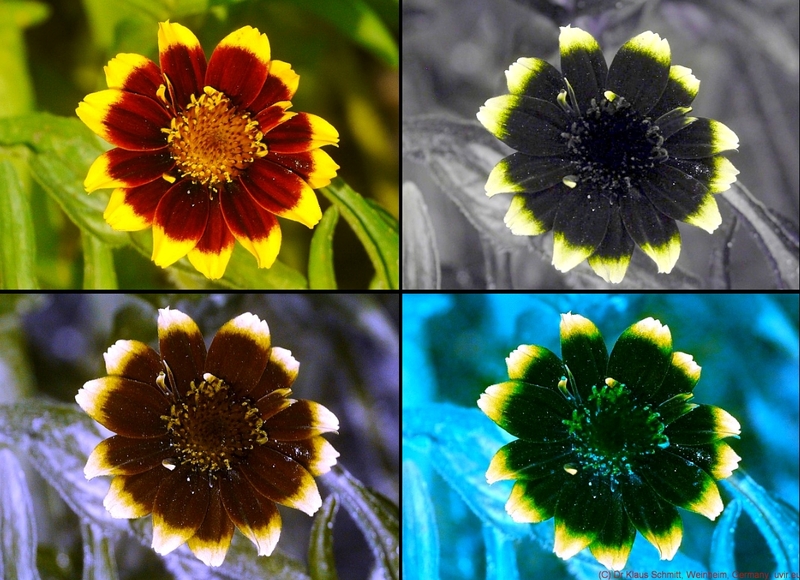 Mexican Zinnia flowers have a very specific UV pattern. Their petals are very UV dark in the middle and bottom, their petal tips, however, are very UV bright (around 370nm outer tip, 365nm middle tip, 350nm border to dark), reaching deeper into UV as any other flower I know of, and all this gets nicely visible. Mexican Zinnia flowers have a very specific UV pattern. Their petals are very UV dark in the middle and bottom, their petal tips, however, are very UV bright (around 370nm left, 365nm right), reaching deeper into UV as any other flower I know of, and all this gets nicely visible.